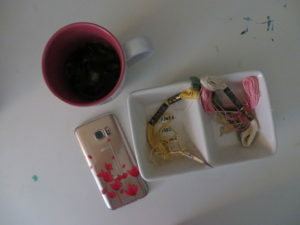 embroidery floss, a phone and a cup of diet Coke. I have a project planned. 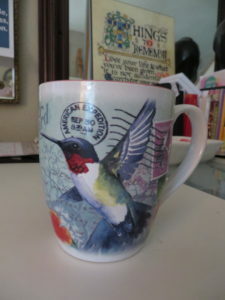 There is a piece of ART that My Larry adores. 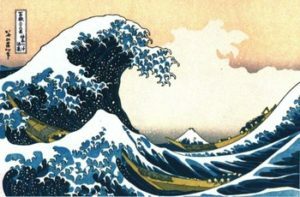 It is a wood block piece, by Hokusai. with the famed WAVE on them. the Hokusai exhibit at The British Museum. It was an amazing exhibit. Ancient wood block pieces that stunned the senses. and I went to the tiny quilt shop in Kapaa. Yes. The Wave appeared again. On fabric! Photo: 4 panels of The Wave. 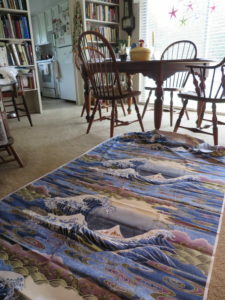 I am looking forward to making a quilt for Larry. many good friends on the East coast.